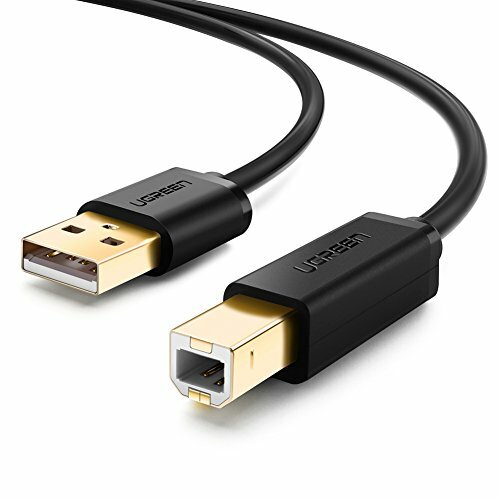 UGREEN 2.0 USB A Male to B Male Cable is the reliable choice for connecting devices with USB Type B Male ports such as printers, scanners, printer switch hubs, and other legacy devices that are economical to keep as a back-up. Corrosion-resistant gold-plated connectors & foil/braid shielding, give this resilient cable long-term use without noise or signal loss. It also protects against RF/EM interference, keeping a clear signal with little bandwidth loss for high performance. Full USB 2.0 capability, 480 Mbps data transfer speed & backwards compatibility, faster data transfer speed than most Wi-Fi connections and better security with compatible equipment. Tough, yet flexible PVC jacket & durable connector mold ensures for secure fits & easy cable handling. Compatible with USB type B printers such as Canon Pixma MX922 / MX522 / MX452 and Epson XP-310 / Epson XP-410 / Brother HL 2270DW / Brother MFCJ450DW / HP Envy 4500 and more. Plug-&-play: Plug the standard Type-A Male connector into your computer, and the Type-B connector into your other device. 1. Verify your device has a Type-B Female port & not a standard USB, Micro-USB or Mini-USB port. ☛ IDEAL PRINTER CABLE: Ugreen USB 2.0 printer cable is ideal for connecting your scanner, printer, server, camera and other usb b devices to a laptop, computer (Mac/PC) or other USB-enabled device. ☛ HIGH SPEED TRANSFER: Up to 480 Mbps transfers data speed for USB 2.0 devices, the printer cable is backwards compliant with full-speed USB 1.1 (12 Mbps) and low-speed USB 1.0 (1.5 Mbps). ☛ PREMIUM QUALITY: Corrosion-resistant gold-plated connectors and foil/braid shielding make the printer scanner cable cords more long-term performance (without noise or signal loss). ☛ WIDE COMPATIBILITY: The Printer Cable is compatible with common devices with USB type B connector like Arduino, Blue, Brother, Canon, CyberPower, Dell, Epson, Fujitsu, HP, IOGEAR, Lexmark, M-Audio, and Samsung. ☛ WHAT YOU GET: A USB 2.0 Printer Cable, our fan-favorite 18-month warranty and friendly customer service. IMPORTANT NOTE: This product has USB 2.0 TYPE B INTERFACE, NOT USB 3.0 Type B.